In this article, I will share the basic stuff you need to know in order to build a photovoltaic solar panel system in your own home. As you probably know by now, with the fall of photovoltaic cells price, the demand for solar panels is getting higher. By building a photovoltaic solar panel system, you will save a lot of money on the long run, but you will also help the environment by not using fossil based energy. As the solar panel market goes up, buying a DYI home-made solar panel system still costs you a lot of money, and that’s why we want to show what you need and where you should get the components for this project. In addition to the components listed above, you will also need to buy other things such as copper cable, switch, meter, fuses, MC4 Connector. Once you have compiled a list with all the necessary components for building a photovoltaic solar panel system, you will have to perform simple calculations and see how many watts per hour you need produce in order to power all the devices in your home. In this regard, you should decide what kind of electronics you want to use in various moments of the day, in order to calculate how much power you’ll need per hour (Watt per hour). Just like the batteries, the size of the solar panel should be chosen correctly, since they will provide the needed “juice” for the batteries. When you calculate the scale of your panels, you should also take into consideration your location, because sunlight is different in various parts of the country. If you are an average consumer, you’ll need at least 4 hours of full light for all electronic devices to work properly. Remember that solar panels get the best conversion rate when they are installed on the south facing roof. 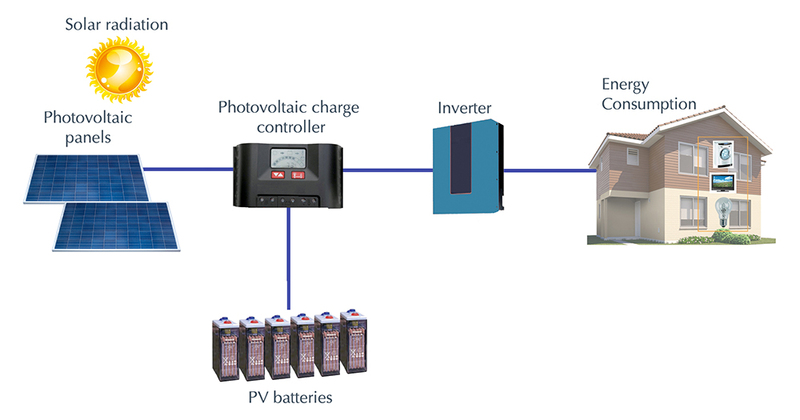 Another important component of a photovoltaic solar panel system is the solar charge controller. Make sure that the solar charger is suitable for solar panels. The solar charger is the device that connects the solar panels and the batteries. It deals with the calculation and adjustment of the voltage coming from solar panels, and is protects your batteries from overcharge. It also features the output that will be connected to the inverter. Simple 1 or 2 stage controls (ON/OFF) – This controller is basic, it stops charging batteries when a certain voltage is reached. Maximum power point tracking (MPPT) – this is the best there is. It adapts the voltage and amperage of the solar panel with the batteries’ capacity. The outcome is extra 10-30% more power. But it’s not cheap. It is usually worth buying if you have a photovoltaic solar panel system over 200 watts. You should know that the solar panels will produce power only during the day and you will not be able to use that power at night without batteries. So, make sure that the batteries you choose have enough capacity to support the overall consumption during the night. There are few factors that you should take into consideration about solar batteries: capacity & power, depth of discharge (DoD), round-trip efficiency, battery life & warranty and the manufacturer. But the most important decision is probably choosing between lead-acid vs. lithium-ion batteries. The common understanding is that li-io batteries offer higher density, improved resiliency, and longer cycle life. But they are also expensive. In your photovoltaic solar panel system, you will also need a Voltage Inverter in order to convert the DC power (12V or 24V) you store in your batteries to AC power (220V) – let’s not forget that most appliances in your home work with AC power. You have to think it through and calculate correctly its power in order to meet the consumption requirements. This article contains the basics of building a photovoltaic solar panel system. If you like the idea of using free energy, you should take your time and get informed on the matter properly. There are many aspects to consider when building such a system by yourself, don’t get caught in cheap components. On the long run, you will end up paying more. These days, everything is accessible. If you want to go really cheap, you can build your own solar 200W panel for under $100. But I’ll assume that you don’t have the skills for that, and I will just share what you need to buy. What’s the difference between monocrystalline vs polycrystalline panels? What should I buy? Monocrystalline solar cells are made out of silicon ingots, they have a better efficiency. Also, they are 15-20% more expensive than polycrystalline. Martha, do you have any suggestions on the gear that we should buy in order to build a DYI photo voltaic system? Preston, I will add a cheap and affordable 1 KW photovoltaic solar panel system setup in the end of the article.